A fresh, light summer dessert will go down well at any Australia Day BBQ. 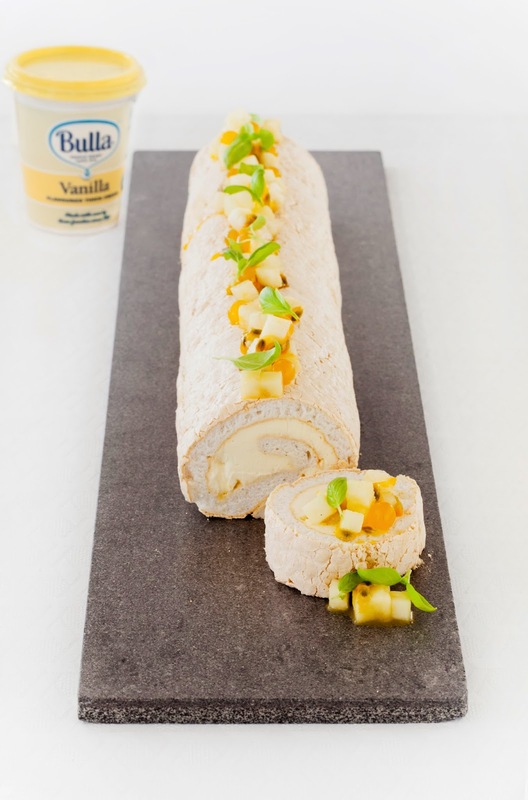 We reckon this Pavlova Roulade will even have the people who "don't eat dessert" coming back for more! your electric beaters (or Kitchen Aid). glossy and firm peaks have formed, add in the vanilla essence along with the vinegar. minutes or until slightly golden in colour. baking paper away and allowing to cool. whisk/beater until it’s semi-whipped. Remove and fold in the seeded passionfruit. Spread the Bulla Vanilla Flavoured Cream evenly onto the meringue sheet. 6. Gently roll the meringue into a tight roulade. mango pearls and baby basil on top to finish. What fruit do you like with your Pavlova?